The majority of endoscopic resections require the use of the rigid bronchoscope under general anesthesia. The latter must be as simple as possible, suppressing consciousness and vagal reflexes, but allowing spontaneous ventilation. The use of the bronchoscope’s closed circuit can facilitate ventilation if necessary. 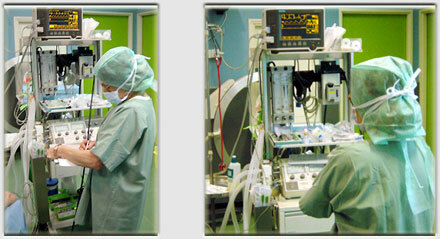 This technique of « spontaneous manually assisted ventilation » also shortens the recovery period. The endoscopists who routinely use the CO2 laser are surprised by our recommendation. This is because CO2 laser procedures are often performed with jet ventilation, paralyzing the patient in order to avoid endotracheal intubation and the risk of endobronchial fire. In our view, respiratory excursion of the airway is not a problem with the YAG laser, because the target is always kept in close proximity to the tip of the laser fiber. The risk of fire is minimized because the metallic rigid tube is not flammable. At our center we avoid jet ventilation, because it can lead to pneumothorax in patients with endobronchial obstruction, or propel debris, secretions and/or blood to the periphery of the lung during the procedure. In addition, paralytics must be used during jet ventilation, exposing patients to potential complications associated with these agents. Given that endoscopic resection is often a last chance approach to patients « in-extremis » absolute contraindications to the anesthesia are unusual. Both the anesthesiologist and the endoscopist however, must be familiar with the patient’s medical history, and consider whether the potential benefits outweigh the risks of the procedure. Most patients referred for endoscopic resection have undergone a thorough cardiopulmonary work-up prior to the procedure including laboratory testing. The latter must include at the very least clotting studies, a cbc, and chemistries. Electrolyte abnormalities, coagulopathy, an abnormal ecg, or incompatibility of a given medication with anesthesia, should all suggest postponing the procedure. 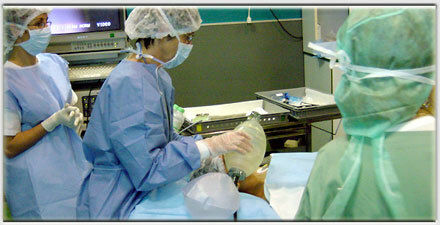 Use of inhalational gas anesthesia, though not practiced at our center, is also possible. Halothane or enflurane can guarantee excellent results, because these gases minimize airway irritability without provoking respiratory suppression thus allowing for a rapid post-procedure recovery. Inhalational anesthetics however, demand closed circuit ventilation during the procedure in order to avoid leaks and imply a certain risk of arrhythmias upon awakening. protoxyde d’azote should not be used on account of its inflammatory risks. Premedication is systematic with Atarax®50 mg (po), administered the night before, followed by Atarax® 100 mg (po) and Tagamet® 800 mg (po) the morning of the procedure. Because patients often present emergently to our service, pre-medication is sometimes given in the endoscopy suite itself. 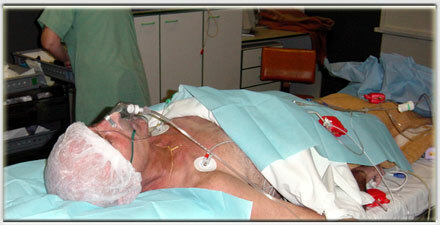 The patient is supine as telemetry, manometry, and pulseoxymetry monitoring are established. 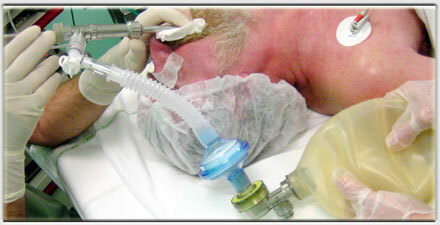 A nasal cannula is used for oxygen administration usually at 4 L/min., and venous access is obtained. 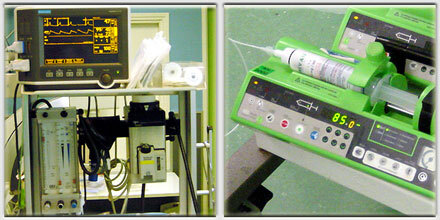 The anesthetic protocol is tailored to the severity of disease assessed for each individual patient. We use the ASA score (American Society of Anesthesiology) which distinguishes 5 groups of patients according to a global impression of their general state of health (ASA 1 : no co-morbidity, ASA 5 : moribund patient) as well as the NYHA classification (New York Heart Association) which distributes patients into 4 groups similar to those of the ASA. 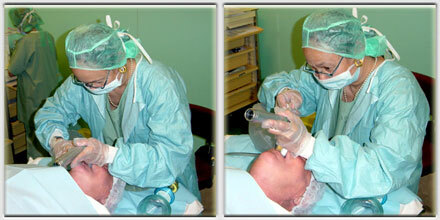 Anesthesia of the glottis is performed under direct visualization with the laryngoscope by spraying 5% Xylocaine. The patient is then intubated with the rigid bronchoscope, which allows both ventilation and oxygenation through its ventilatory side-port. 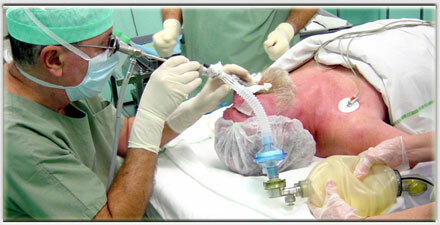 Manually assisted spontaneous ventilation is the preferred mode of ventilation in our service. That is, the patient is allowed to breathe spontaneously, and is occasionally manually assisted by the anesthesiologist (a mechanical ventilator is never used). In the meantime, the FiO2 is kept at 100%, anesthesia is maintained with Diprivan® 1mg/kg/h iv and Alfentanyl® 20 gamma/kg i.v. boluses every 15 minutes. 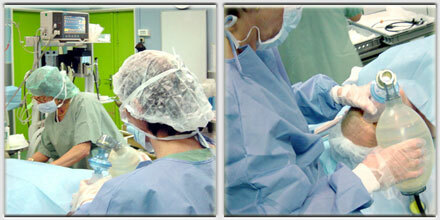 The FiO2 is then lowered to meet the patient’s demands, and must be kept below 50% during laser resection. Induction with Etomidate® 0.3 to 0.4 mg/kg I.V. Diprivan® 1mg/kg/h I.V., is administered using an electrical syringe which guarantees control over the rate of administration of the drug. This method diminishes the severity of muscular contractions induced by Etomidate®. The latter is also quite frequently responsible for arterial hypotension. We treat this unwanted side-effect of the drug with fluid resuscitation using Lactated Ringers® and Ephedrine® boluses of 3 to 6 mg I.V. every 2 minutes as needed. When the level of anesthesia and the patient’s respiratory status allow it, the bronchoscope is inserted. 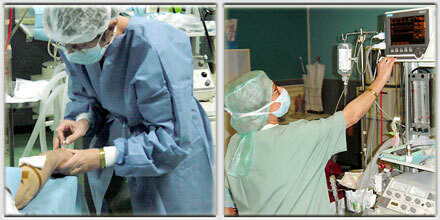 The anesthetic regimen can be modified to meet the needs of the patient and the procedure. Successful anesthesia must be accompanied by a compulsive control of the patient’s oxygenation preventing hypoxemia before and during the endoscopic treatment. The safety of endoscopic resection relies heavily on the close collaboration of the anesthesiologist and the endoscopist. The latter must give priority to the former in case of apnea, bronchospasm, hypoxemia, or other complications, while the anesthesiologist must strive to provide the endoscopist with the conditions necessary for a successful procedure. The anesthesiologist’s role is essential in case of bleeding, complications during resection, or assisting in the replacement of one bronchoscope with another.